Storyline: It was a peaceful night on the house of a rabbit family. The multiple kids were quietly playing on the floor where the toys, one more electronical then other, were laying all over. One child had a baby remote, another was speaking with a friend on its laptop, still some other bunnies were listening to iTunes or playing on their tablets. A desktop computer was tuned to Angry Birds while in other corner of the family room a huge HDTV boomed with cartoons of a moon landing party. An old lady sat on her chair by a fake fireplace, dad was reading his Nook while mom, out in the world somewhere, was calling home on a BlackBerry with an Eminem ringtone. Everybody seemed content. And though the room was beaming with noises and sounds and blips, from emails and tweets and games and viral clips, you could see that everybody pretty much ignore it, minding its own device. Everybody but the “fed-up old woman who was trying to sleep” by her fake fire on her fake chimney (actually a still image played on a dvd hooked to a TV and set in front of the real fireplace). She had had enough. And in an impulse, she decided to put an end to all this, throw away the gadgets and put the kids to sleep. She got up and started with the iPad. Then one by one, the phones, computers, tablets, tvs, flew out the window, their owners still attached to them till the very end. It looked like a hard fought battle ground, with crying baby and adults as well. But in the end, the old woman won. The room was nice and neat, and all baby rabbits tucked to sleep in their beds. And they all were listening to the old woman as she was reading them a book: Goodnight Moon. The story is in rhymes. 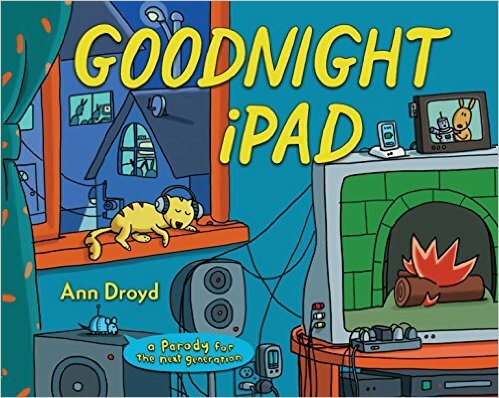 It is also a parody of Good Night Moon by Margret Wise Brown. And the author’s name is actually David Milgrim. Illustration: Ann Droyd is the illustrator of this book. He fills up the page with images, the text, as in a cartoon, poking out here and there where necessary. The drawing is schematic but the multiple gadgets are very well done, so that you would easily recognize them, even though since the book was published, in 2011, some have changed their appearance. The colors are bold and bright. You really have to “read” the illustration along with the text so that you get the whole “picture”.